Using Videos, Animations and GIFs in your Pear Deck? Get ready to Power-up! Want to show a video about the Mars Rover in your Pear Deck presentation? Need to carefully layer in information on a slide to reduce information overload? Found a perfect GIF of a plant emerging from its seed? 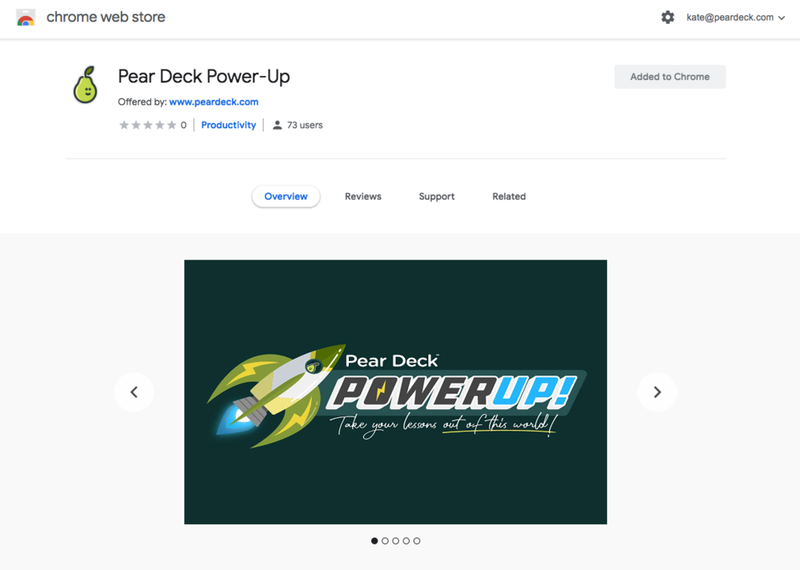 If you want your videos, animations, and GIFs to play at full resolution when you present with Pear Deck, install the Power-Up Google Chrome extension. The Power-up is a free Google Chrome extension. Installing it ensures that videos, animation, and GIFs embedded in your Pear Deck slides play at full-resolution on the projector and student devices—exactly the way they should! Install the Power-up from the Chrome Web Store on the device you use in class. Now when you present with Pear Deck, the Power-up magically enables the display of your videos, animations, and GIFs. In the Google Chrome Web Store, click on Add to Chrome and Add the Extension. Accept the permissions and Voila! You've installed the Pear Deck Power-up. Now each time you present with Pear Deck, your videos, animations, and GIFs will be embedded and play at full resolution. Design a new presentation or open an existing one in Google Slides. Go to the Add-on menu and open the Pear Deck Add-on. Want to show a video about the Mars Rover? Do it. Need to carefully layer in information on a slide to reduce information overload? Now you can. Found a perfect GIF of a plant emerging from its seed? Now's the time to power-up!. Start your presentation and students will join your Pear Deck Session from any device with a web browser. As you advance your slides, students will be prompted to answer your questions! Now GET READY TO SUPERCHARGE YOUR DECKS!